The Palm Oil Bootcamp 2015, which took place from 17-23 August 2015 was successfully organised recently. The programme is a collaboration between IJM Plantations Berhad, Universiti Malaysia Sabah (UMS) and the Malaysian Palm Oil Council (MPOC). 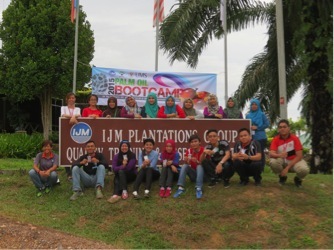 The Bootcamp's main objective was to expose young undergraduates to the daily activities within an oil palm plantation and its related supply chains, with the hope that the exposure could inculcate an interest among participants to contribute positively to the Malaysian palm oil industry upon their graduation. This may be either by choosing a career within the industry, or disseminating information that they have learned to their peers, especially on sustainability issues. 18 UMS students were shortlisted for the programme based on their academic and extra curriculum achievements. The group toured IJM Plantation Berhad's various facilities in Sandakan, Sabah. 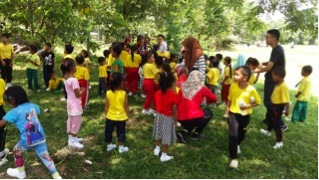 These included visits to its Quality, Training and Research Centre (QRTC), Desa Talisai Estate, its '100 Acre Wood' in Sugut and a volunteer teaching session at a HUMANA children's learning centre. 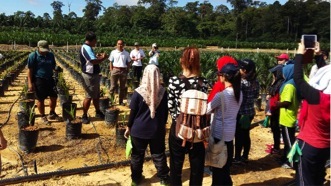 The programme provided the participants with practical knowledge-based learning experiences which covered the entire palm oil production supply chain. These sessions included the pre- and main nursery facilities where the seedlings are produced, the estates where field planting and harvesting takes place, to the mills where Crude Palm Oil (CPO) and by-products such as composts are produced. Participants indicated that they found this programme to be extremely beneficial and also changed their perceptions positively on the sustainability of the Malaysian palm oil industry. The participants, especially the final year undergraduates also expressed a strong interest to choose the palm oil industry as a potential career pathway upon their graduation. MPOC hopes similar platforms such as this Bootcamp will be created to develop future leaders to ensure continuity within the industry by helping to create a knowledge based workforce.